Kids,in September 2017,I had the opportunity to travel to South America for work and it was epic! I nearly went nuts at the sight of this cute onesie at the local mall! I’d have bought it there and then but you guys were still at least two years away from being born so sanity prevailed! The Garden itself is beautiful and reminiscent of Central Park. I loved how locals and tourists alike roamed about and enjoyed the scenery, even during a work day! My must-haves for cities I travel to are simple: food, magic, theatre shows and street art. 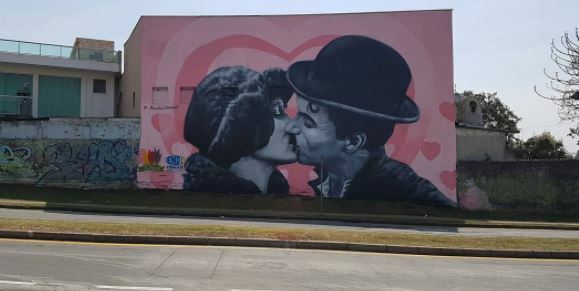 In Curitiba, street art is everywhere you go and this one was by far my favourite. A relaxed vibe permeates everything in Curitiba – from the unhurried way people speak to their late meal times and more. I was learning to love this laidback way of life and I was sure I’d be back for more. Next on How I Met Your Father: A fiery love affair with Sao Paulo!